Because I couldn't bare to cut the tab off this guy, but I wanted to put him on one of the Necromunda bases, I cut a slot into the base. These bases are nice for that as they have lots of grooves already there, so it was just measure and cut. Then, I followed the same basing method as I use with my Plague Marines to cover the slot and make him look like he really is in the nether regions of Necromunda's hives. 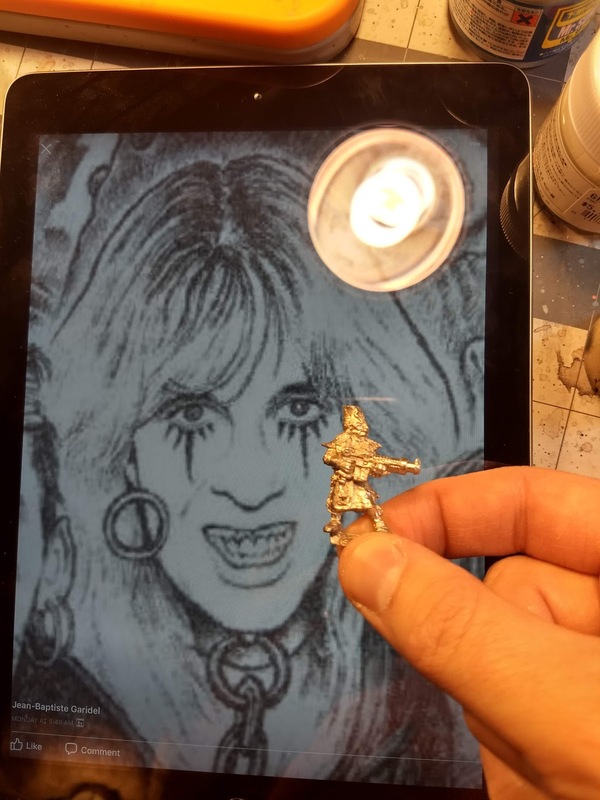 After that, he was zenithally primed from the airbrush and then painted the metal parts of the base silver. After that was dry, I applied AK Interactive's Heavy Chipping Fluid. After that, I misted on very thin coats of various rust colors. I didn't give it long enough to dry, so the thin coats from the airbrush actually started the "chipping" process for me, although it tended to pull up in blobs, but it still gave it a pretty cool look. The dirt was just light brown washed with various dark washes. When it came to the model itself, I wanted to give him a pretty faded and worn look. The gun was painted in Scale 75 Black Metal and given a highlight with Heavy Metal and Thrash Metal, which has a nice brown undertone to it. After that, I washed it with AK Interactive Streaking Rust, which was allowed to dry and then swabbed with oderless mineral spirits to make the rust less overpowering and more natural looking. The armor plates were done to look like brass as I figured that is what he would find in the underhive; scrap metal that barely qualifies as armor. I based that in Decayed Metal, also from Scale 75 and highlighted first with VMC Bronze and then by mixing in Scale 75 White Alchemy. After that it was washed with GW Athonian Camoshade and then stippled with various greens, thinned pretty heavily. The leather "tabard" was based with GW Dryad Bark and highlighted up by stippling mixes of Dryad Bark and GW Terminatus Stone Air. 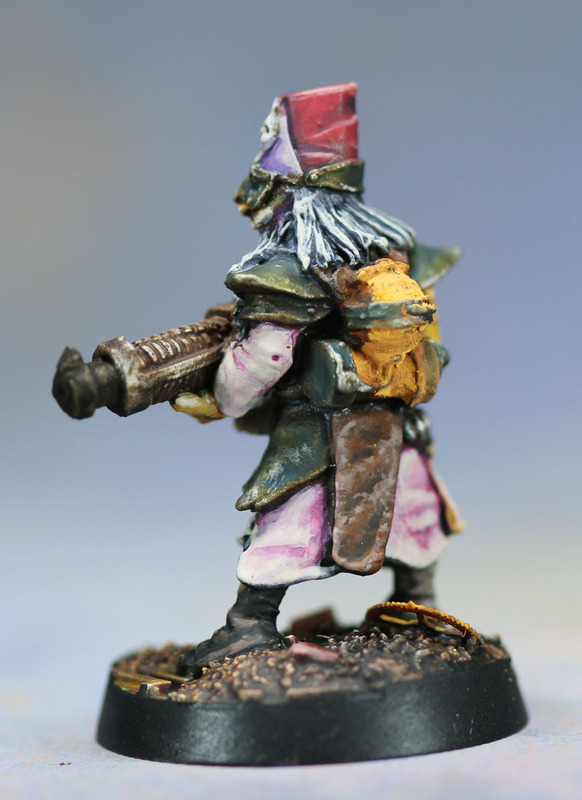 Then the metals on his pack were done with rust pigments (after the rest of the model was completed). Once the boring parts were out of the way, it came to the fun parts. I wanted to make him look rag-tag, like he's wearing random clothing he's found, but also play with both contrasting and harmonious colors. So I decided to run with the Yellow-Purple as the contrast, since the purple would give me lots of shading opportunities and yellow would work well with off whites that I was thinking the bulk of his robes. 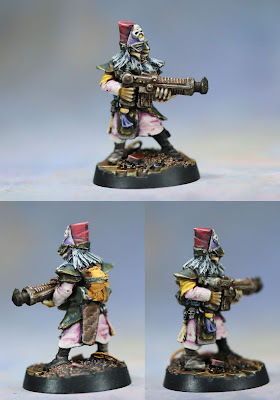 The yellow sleeve was GW Averland Sunset and highlighted by mixing in Terminatus Stone Air. After that, I washed with with GW Casandora Yellow. The hat was GW Evil Sun Scarlett (it reminded me too much of a fez to not paint red) and shaded by mixing in Naggorath Night and applying in very, very thin glazes. To highlight, I tried a bunch of different colors to mix in and finally settled on a mix of VMC Ochre and white. This mix was added to the Evil Sun Scarlett and applied in thin edge lines. The bill of the hat GW Rakarth Flesh also shaded with Naggorath Night. The rest of his robes were several layers of Terminatus Stone Air, to which Scale 75 Hastur Purple, and also applied in very thin coats and only in the recesses. Thin layers of Terminatus Stone Air were reapplied back and forth with the various shade tones to make sure the blends were smooth. Another reason I went for the yellow-purple contrast is because Scavies are described as having yellowish skin. For this, I used Zamesi Desert and again used Terminatus Stone Air for the highlights. 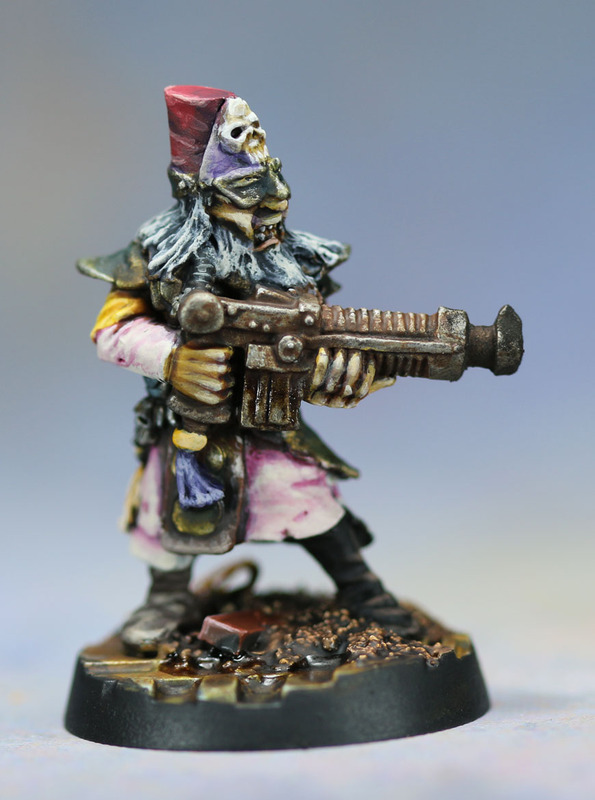 After that, I washed all the flesh with GW Seraphim Sepia and then just the deepest recesses with Druchii Violet. The beard was GW Skavenblight Dinge and highlighted with the Terminatus stone and finished with pin wash of Payne's Grey oil paint. So, all in all, I'm quite happy with how he came out. Now, go check out the gallery of all the entrants! It's a brilliant paintjob on one excellent sculpt. I really like how he does look rag tag without the colours clashing annoyingly. Really good work here. That's a really striking and unusual colour scheme on a rarely seen figure. I love the colour choices- they've come off exactly as you intended - he looks every inch the rag-clad scavenger. Great work. 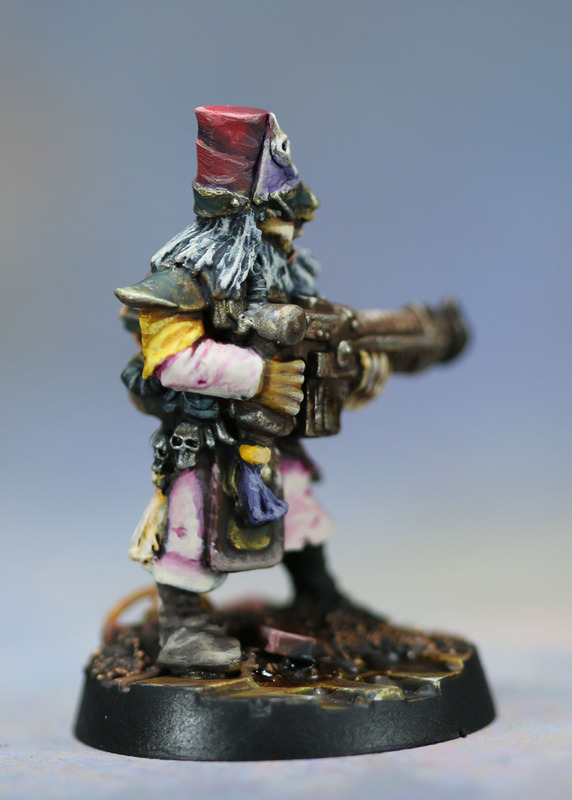 Fantastic mini and great painting!